In a heart and soul performance, rugged warrior Rene “Gemelo” Alvarado (25-8, 17 KOs) from Managua, Nicaragua triumphed over Maracaibo, Venezuela’s Roger “The Kid” Gutierrez (15-1-1, 11 KOs) with a technical knockout victory that handed Gutierrez his first career loss as the main event on Boxeo Estelar. The fighters left nothing behind on the mat, Alvarado giving Gutierrez a hard time and a bloody right eye. 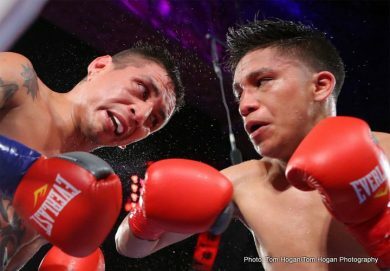 Gutierrez’s corner waved the fight off at 1:34 in the seventh round of the super featherweight bout. 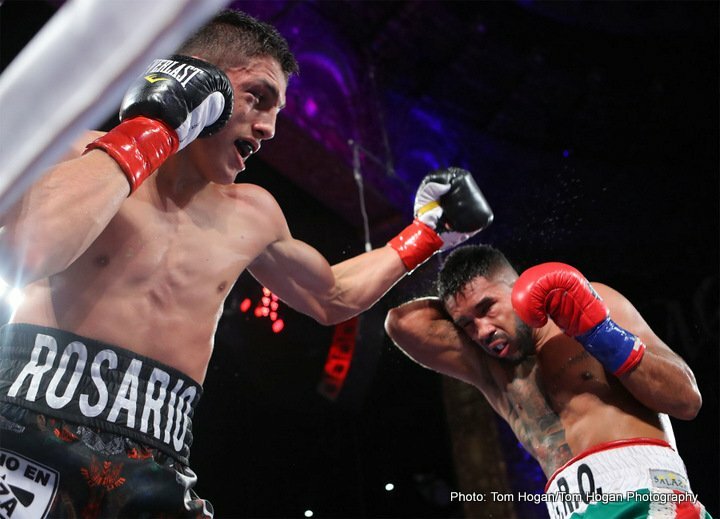 Special VIP guests of the night included NABO Super Featherweight Champion Alberto Machado, NABA Super Featherweight Champion Carlos “The Solution” Morales, Christian “Chimpa” Gonzalez, Abraham “El Chamaco” Lopez, and David Mijares. 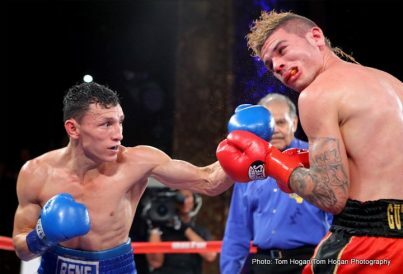 In the co-main event slugfest, South Central Los Angeles featherweight Edgar “Kid Neza” Valerio (11-0, 6 KOs) went toe to toe with Torreon, Mexico’s Jairo Hernandez (18-12, 9 KOs) in a scheduled 8-round featherweight bout. The fighters went back and forth with their aggression, Valerio bringing Hernandez to the floor in the first round and Valerio tasting the mat in the second. The back and forth action had the crowd on their feet, however the judges declared Valerio the victor with scores of 80-71, 80-71 and 79-72. 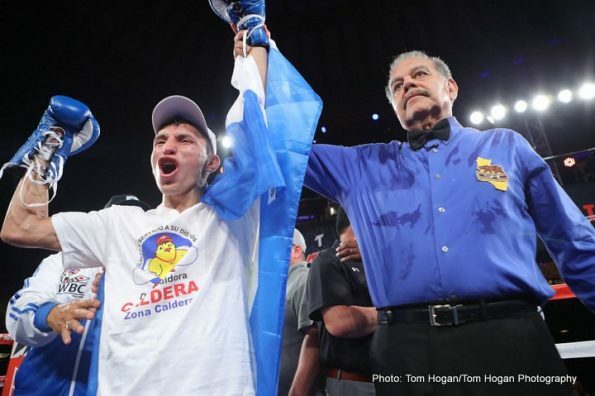 Moved up to be the televised opener for the Estrella TV Boxeo Estelar telecast, WBC Youth Silver Flyweight Champion Joshua “The Professor” Franco (12-0, 6 KOs) of San Antonio, Texas improved his record in a six-round fight against Antonio “Tony” Rodriguez (8-16, 3 KOs) of Gomez Palacio, Mexico. The battle lasted all six rounds, Franco putting in work to the body and stunning Rodriguez through various points in the fight. The judges all unanimously decided Franco was the victor with scores of 60-54. 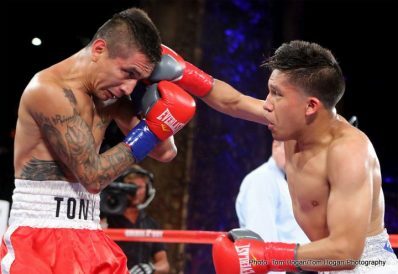 Huntington Park’s Cristobal Ortiz (2-0, 1 KO) finished his business early in a scheduled four round super lightweight bout against Ronald Rodriguez (1-6, 1 KO). Rodriguez made Ortiz hit the mat once, but Ortiz came back even harder. 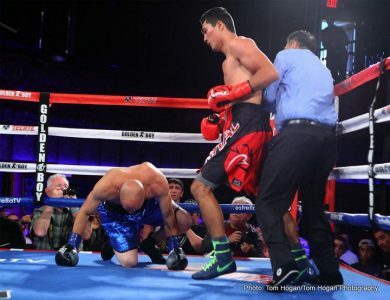 At the 1:46 mark into the second round with a spectacular right hook to the jaw, Rodriguez collapsed as the crowd jumped in jubilation, adding the first knockout victory to Ortiz’s record. 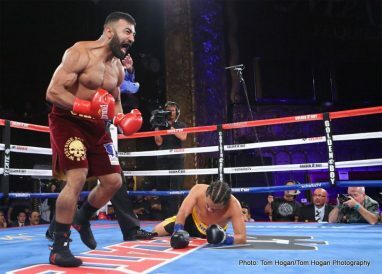 Opening up the fights at LA FIGHT CLUB and RING TV livestreamed portion, Oxnard, California’s Meiirim Nursultanov (3-0, 2 KO) knocked out his opponent at the 1:47 mark of the first round in an originally scheduled six-round super middleweight bout against Houma, Louisiana’s Lanny Dardar (5-8-2, 3 KOs). 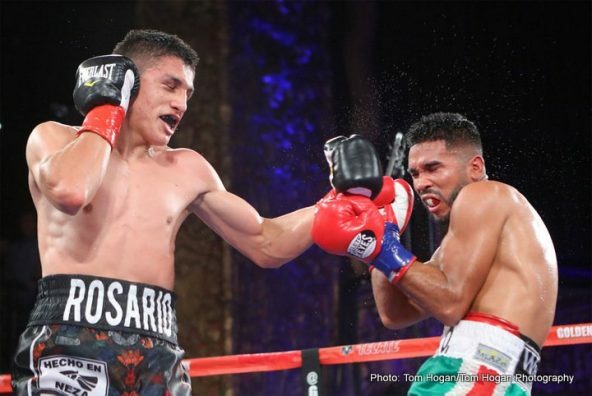 Gutierrez vs. Alvarado was an eight-round super featherweight fight presented by Golden Boy Promotions and sponsored by Tecate “Born BOLD”, and Casa Mexico Tequila.